East Texas has none of the wind-power potential of West Texas. But it does have plenty of pine trees. And so, 40 miles apart, two first-of-their-kind power plants are going up near Lufkin and Nacogdoches. They will burn the woody debris to make steam, and that steam will turn generators to make electricity. But environmentalists, pulp mills and locals have concerns about the plants — which could also take an economic hit, because they are coming online during a slump in energy prices. Driving his mud-spattered Suburban through a wood storage yard, Danny Vines gestures out the window at piles of lopped-off logs and bushy materials. Just down the road from the storage yard, Vines' company, Aspen Power, is building a first-of-its-kind power plant in Texas: one that will burn the woody debris to make steam, which turns generators to make electricity. The roughly $128 million plant in Lufkin is expected to begin running tests this month and should start full operations in the spring. Interest in building power plants fueled by wood waste has recently surged in East Texas, which has none of the wind-power potential of West Texas but does have plenty of pine trees. Forty-five miles away from Lufkin, in northwestern Nacogdoches County, a larger plant with the capacity to power about 75,000 homes is being built by Southern Company, an Atlanta-based utility holding company. That plant, which will sell its power to Austin Energy, broke ground a year ago and should be operational by mid-2012. Two other plants, near Woodville and Lindale, received crucial permits from Texas air-pollution regulators this year, though construction has not yet started. A fifth plant, near Greenville, has an application pending. The case for biomass power is that it derives from a renewable resource: trees. The power plants can produce electricity around the clock, unlike wind turbines and solar panels, which work only when the weather is right. They also create jobs. The Texas biomass boom comes at a curious time, however. Natural gas prices have fallen to about one-third of their highs from two years ago, which means that the plants may have to sell their electricity for far less than they had originally hoped. Vines says the Lufkin plant has received about $1 million in state and local grant money, and will soon apply for a substantial federal grant (available through the stimulus program). 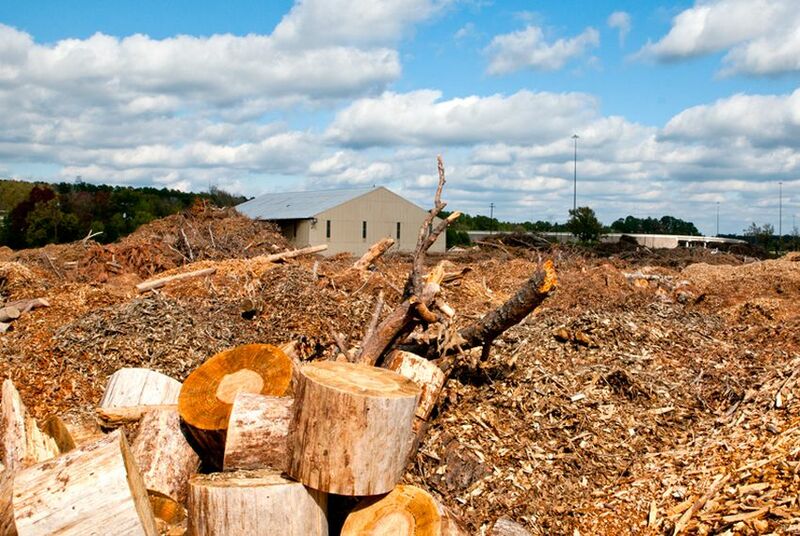 Biomass power made from woody debris represents about 1 percent of the nation’s electricity supply. While the amount of power from other renewables like wind and solar has increased in recent years, biomass power production has merely held steady, because few plants have been built. Most existing plants operate in the Northeast and especially California, but Southern states — eager to get into the renewables business with a homegrown resource — have shown interest over the past several years. Across the Southeast, Whiting estimates, there are roughly 10 standalone biomass plants, with four more — including the two in Texas — currently under construction. The plants have run into opposition from several groups, including environmentalists. Neil Carman, the clean air director of the Sierra Club in Texas, says he is skeptical of the claims by biomass plants that they are “carbon-neutral” because the calculations would depend on how long it takes for the trees — the original source of the fuel — to grow back. Indeed, a few years ago locals raised concerns about pollution from the Lufkin plant, which is co-owned by Vines. That led to a protracted and rancorous permitting battle in which the Environmental Protection Agency got involved. Eventually, improvements in pollution controls were required, says Aaron Hartsfield, a postal worker who lives about a half-mile from the plant. The pulp and paper industry also has reservations about potential competition for woody debris. Biomass plant operators insist they will use leftover materials — the Lufkin plant, for example, plans to use logging debris and limbs remaining in the forests that would otherwise rot or get burned, as well as trees and shrubs cut down by homeowners, and available wood waste from mills. But sometimes, wood waste gets used for other purposes. Pulp mills, for example, use their debris to generate energy within their plants (as opposed to feeding it into the electric grid). There are 50 to 100 such plants across the Southeast, including in Texas, Whiting says. “Potentially, you’re driving up the cost of their feedstock,” says Luke Bellsnyder, executive director of the Texas Association of Manufacturers, whose members include pulp and paper mills. Landowners, however, will welcome a new market for their product, says Ron Hufford, executive vice president of the Texas Forestry Association, whose members span a range of forest-industry players, including some of the biomass plants. The biggest question hanging over the Texas biomass industry right now, however, is economics. When many of these plants were conceived, energy prices were much higher, so the plant operators assumed a bigger return. An exception of sorts is the plant in Nacogdoches County, which Southern Company acquired last year. Before construction started, the plant’s previous owner had signed a contract with Austin Energy in which the capital-area utility agreed to buy the power for 20 years. Natural gas prices were then perhaps three times what they are today, and there was anticipation of a potential federal price on carbon-dioxide emissions, according to Michael E. Webber, associate director at the Center for International Energy & Environmental Policy at the University of Texas. Webber was part of a commission that is tasked with reviewing Austin Energy’s policies, and he voted in favor of the plant in 2008. Even back then, the plant — conceived to help satisfy Austin Energy’s goal of getting 30 percent of its power from renewable sources by 2020 — was controversial, Webber says. Now, he says, “it’s hard to justify biomass” with gas prices so much lower. This year the state’s Public Utility Commission considered crafting a requirement for 500 megawatts of power from non-wind renewables, which would include solar and geothermal power as well as biomass. (For comparison’s sake, the Lufkin plant is 50 megawatts, and the Nacogdoches County plant is 100 megawatts.) But it has not acted, and the Legislature is likely to consider the issue. Asked when he and his partners would break even, Vines said the answer was “contingent on the development” of a 500-megawatt, non-wind requirement. Environmentalists also support a non-wind renewables requirement, but the powerful manufacturing lobby will stand opposed, fearful that it would drive up electricity prices. “We will not support a mandate or a subsidy requiring biomass,” Bellsnyder says.